The analysis from the Joint Committee on Taxation is correct. Tax revenue will rise if we assume 2.9 percent economic growth. Seriously. That’s it. I included the entire plan above so you could check to make sure I’m not exaggerating. There’s literally no analysis at all. The Treasury Inspector General has already promised an investigation into the missing report that hundreds of people were supposedly working on, and after seeing this I really, really want to see what the IG comes up with. The only plausible scenarios are either (a) nobody was ever doing any serious analysis, or (b) they did a serious analysis and the results were too catastrophic to be released. 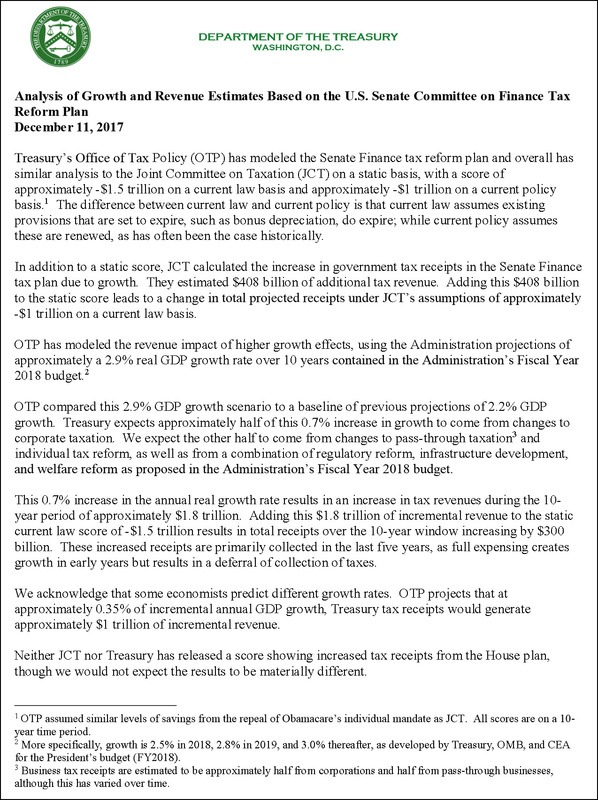 So instead we got a one-page report cribbing from JCT and explaining that tax revenues will rise if economic growth skyrockets. A tenth grader could have written this. Welcome to the Trump era, folks.